Regular readers know The Time Bum's admiration for the Melbourne Watch Company. Owner and designer, Sujain Krishnan, consistently turns out sophisticated and beautifully finished watches like the Flinders, Hawthorn, and Portsea. His latest is the Parkville, a traditional dress watch now available for pre-order with delivery expected in November. Like Sujain's previous models, the watch pays tribute to his home city of Melbourne. 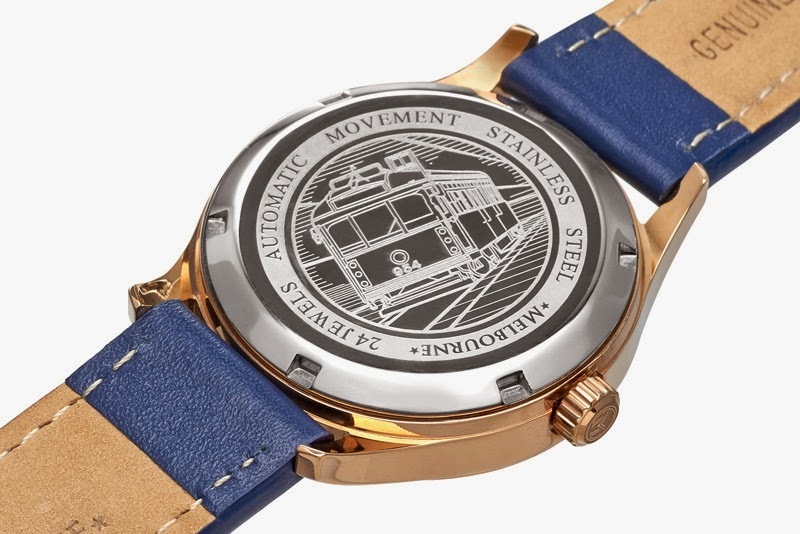 The name is that of Melbourne suburb, and an image of a W-Class tram is engraved on the case back. This is the smallest offering to date, measuring 36mm in diameter. It has a sapphire crystal and 30 meters water resistance. In another first for Melbourne, a Seiko NH35A automatic movement handles timekeeping duty. This is a quiet and reliable unit with 24 Jewels, a 21.6k beat rate, and a power reserve of over 40 hours. The white dial features four slender Roman numerals printed in a radial arrangement, an index of simple dots around the perimeter, and blue feuille hands. The center is decorated with a striking rosetta spiral guilloche pattern. The Parkville is available in both stainless steel and rose gold plated versions, both with leather straps. From the prototype pictures, the Parkville looks like a winner. The watch shows Sujain's usual elegance and attention to detail. 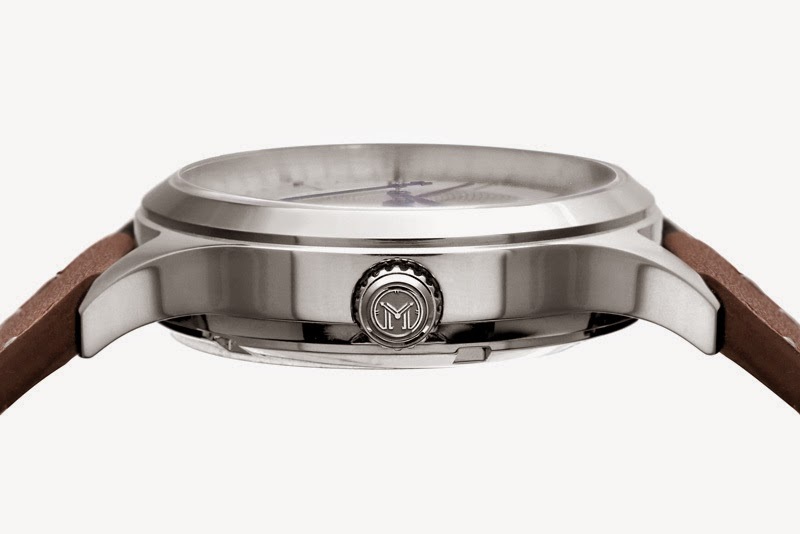 The guilloche dial is a lovely touch and I believe small case size is ideal for the design. It is the proper size and style for a men's dress watch and would be equally suitable as an everyday watch for a woman. 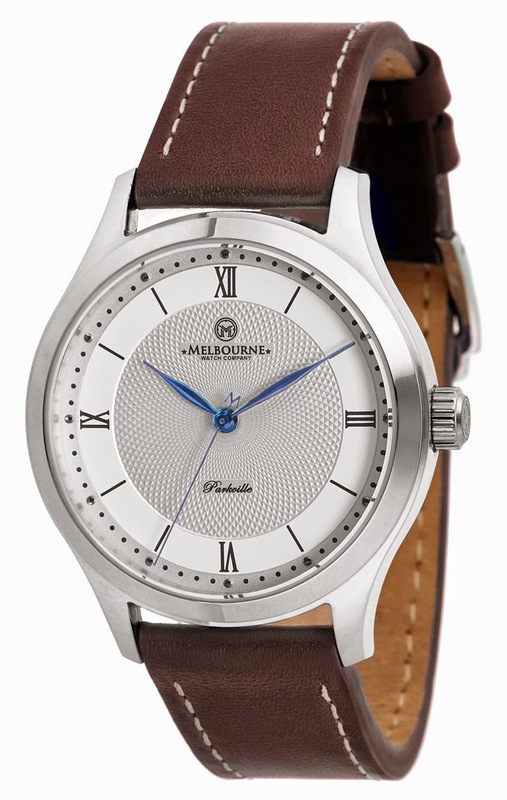 The Parkville may be ordered directly from the Melbourne Watch Company website. It ships in a hard-shell case with 24 month warranty. When released, the stainless steel version of the Parkville will have an MSRP of $479 AUD silver, $489 AUD gold. Pre-order prices start at $379 (@$348 USD). Photos courtesy of Melbourne Watch Co.